Fox Sports Posts the 2018 FIFA World Cup from L. A. With the help of Telestream, FOX Sports has developed a new post production workflow to help bring the 2018 FIFA World Cup soccer tournament to U. S. audiences, and to help them watch the bottom line. 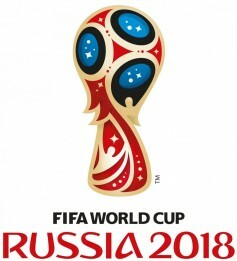 Instead of sending multiple post production crews over to Moscow from 14 June to 15 July to put together promos, half-time packages and post-game highlights, they’ll be bringing only the needed video material back to their headquarters in West Los Angeles so they can do the heavy post production work over here. Ken Haren, marketing director at Telestream, told me in an exclusive interview, the company was tasked with getting all the video assets that were going to be shot in Putin’s paradise back to the Adobe Premier edit bays at the FOX Sports headquarters in west L. A. The solution that will be rolled out later this June is will split the content into two IP-delivery paths; one broadcast-quality digital video, the other editing-quality proxies. At its heart is Telestream’s Lightspeed Live Capture system, which takes a real time baseband HD and UHD video signal and encodes it into a low-rez HLS (HTTP Live Streaming) proxy for each channel that is being processed. 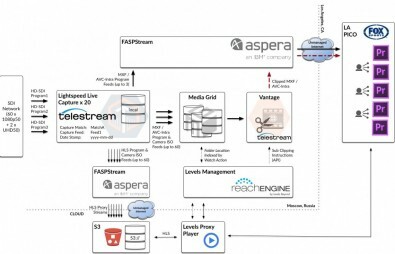 The files are then sent by an Aspera FASPStream transfer system (FASP stands for Fast and Secure Protocol) API (Application Programming Interface) that supports data into or from a custom process running in memory. Meanwhile, another video can be in handled on a separate machine (stream-to-stream), or with a standard Aspera transfer server (stream-to-file). Tests show that the transfer results in a latency delay of less than 20 seconds, usually around 14 seconds, faster than most satellite delivery. These low-rez proxies are streamed to the Amazon cloud and then down to FOX Sports on Pico Blvd. in L. A., where the producers can watch all 60 of the camera feeds. When producers see something they like, they mark in/out points in the proxy, and this kicks the second delivery path into action. Telestream’s Vantage media processing platform retrieves the desired high-rez AVC-Intra version of the footage at 220 Mb/s and delivers it to the FOX Sports edit bay timelines or storage in Los Angeles. This transfer comes over unmanaged, commodity internet networks, which is much cheaper than bouncing it up to an orbiting satellite and back earthward for distribution. The selection process that awarded Russia the 2018 FIFA World Cup venue was fraught with controversy. Can this be seen in UHD? Yes, but only if you have a Hisense TV set. 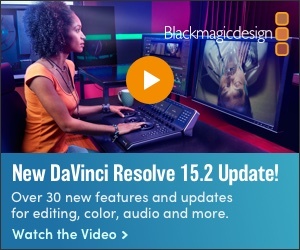 This arrangement may be a harbinger of future remote production workflows. Broadcasters could use such a solution to cover live sports from anywhere in the world.